Newcastle is less dependent on the car than Councillors and civil servants would like you to believe. We had a look behind the scenes… at the statistics. It started with Neil Murphy putting the Census 2011 data into context for us here and Claire Prospert summarising and explaining further here. Whilst cycle to work numbers (this is the data the Census collects) are generally pitifully low compared to our European brothers and sisters who enjoy 10, 20 even 50 and 60% of bike-commute modal share, in Newcastle it’s the wards North-Northeast of the city centre that cycle more. 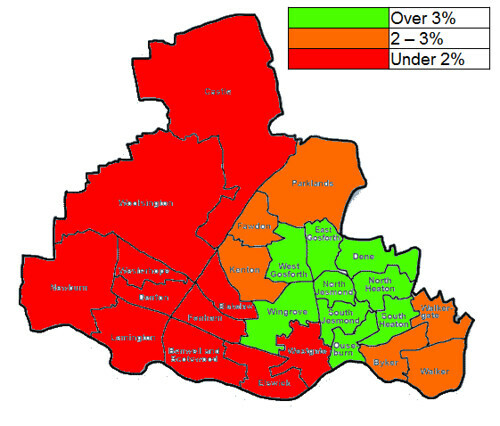 The highest is North Jesmond with 5.2% followed by East Gosforth and South Heaton (5.1%), West Gosforth at 4.9% – here is the ranking of wards with over 3%, also shown as green on the map. The census data also allows us to have a look at data for households without a car. Good news! At 41.7% Newcastle is well above the national (25.8%) and regional (31.5%) figures. The largely car-less wards are Westgate (that’s the city centre) with 3 out of 4 households without a car, hot on the heels are Elswick, Walker, Byker, Ouseburn and Wingrove. 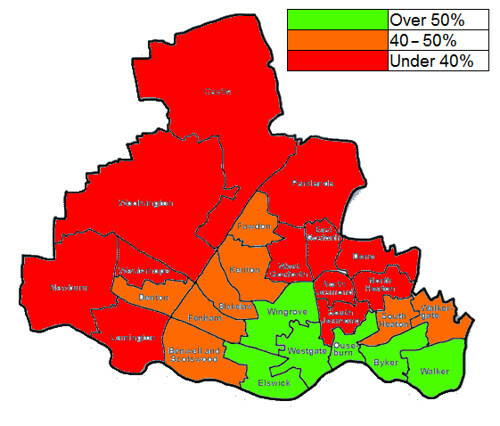 Here is the list of wards where over half of the households don’t have a car; they are also represented in green on the map below. 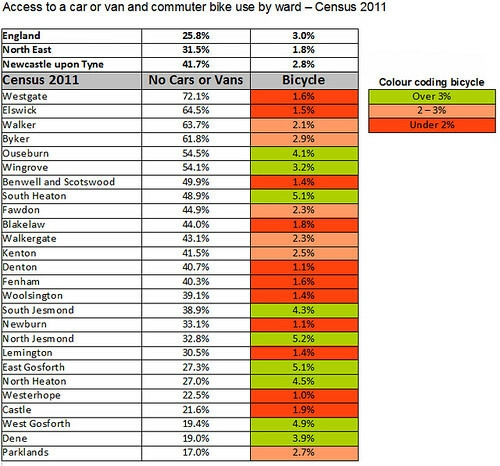 It’s interesting to note that Ouseburn and Wingrove are on both lists and hence ranking pedal-positive. And it is noteworthy too, that the wards with high car ownership Jesmond (North and South), Gosforth (West and East) and North Heaton also have higher bike use. Regardless of Newcastle’s pro-bicycle policies, for any Councillor of the wards listed above to promote highway schemes is counter-productive if they really wanted to provide for their ward residents. Who Walker and Byker Councillors really spoke for on the yet-to-be-announced Welbeck Road scheme remains anyone’s guess.